The Mathern Course at St. Pierre Country Club is shorter than the Old Course, but equally as enjoyable with its stunning parkland design. The shorter length makes it ideal for an early morning game before work or a meeting. The Mathern Course is also a refreshing end to a day spent touring the surrounding attractions in Wales. 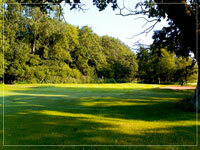 The Mathern Course was remodelled in 2007 by European Golf Design architect Ross McMurray. Work included the construction of 18 new tee complexes and the reconstruction and repositioning of bunkers. The project also included significant tree surgery and improvements to drainage and irrigation.